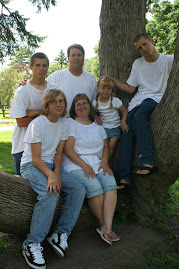 This blog is about our daughter Annika and how she has been a true blessing from God. She lost her hearing and has mobility issues because of an illness as a small baby. She has truly taught us endurance, joy, love, patience, and just the ability to laugh at any circumstance. You are truly a gift from God and taught us to be aware of the simple things in life. Love Mom and Dad. Annika turned 8 on Saturday!!! So hard to believe that my little girl is that old already!!! On her birthday, we had to attend section individual wrestling tournament for her brother, Dan. She was so happy when she woke up that morning when she found out we were going to see wrestling. Not so happy later on when she found out that we were not going to have cake that day. She was a trooper and when her brother took 4th place in his weight class, she walked around saying, "Dan did a good job, we are proud of him right Mom?" Yes, Annika you are right we are proud of him. On Sunday we did have cake and ice cream with just the immediate family so Annika officially moved her birthday this year. Her birthday was Sunday as far as she is concerned. And for now that is fine. We will have the "big" family/friend party this Sunday. She doesn't know about that yet so it will be a surprise. Annika is in dance this year and they did ballet for the first half of the year and now they have moved on to tap. The last few weeks Annika has come home from dance class just totally not herself. She loves dance and we know that but she was just crabby and irritable. Last night we were able to find out what her issue is. She says that dance class is "too loud" now with the tap shoes. Believe me I have heard the noise through the door and I know exactly what she is talking about. That being said it just amazes me in the world we are living in. I have a child who is technically deaf but she is complaining because dance class is "too loud". How is that possible!?!?! Only through the world of technology. Yesterday, Annika received her wheelchair. This has been about a 3 month process and she took to it like a fish in water. Mainly this will be used for her whenever there are long distances involved. But that being said, she loves it and I fully expect to be chasing her down the road this summer in it. She picked out the color red because it matches Lisa's red convertible so you can figure out where her mind is going!! Last night she had to eat supper in her wheelchair. I told her she could for the first night but she is not going to be using it every night. She agreed. Time will only tell. Now I have the fun job of trying to make my house more wheelchair friendly. It should be very interesting around our house the next few weeks. This morning she got up and found a button we had made of her brother, Dan, from wrestling. She had to wear this on her coat today. He has wrestling team finals tonight and she is proudly showing him off today. Where would she be without those brothers of hers? Gotta run but hope to get a picture of Annika and her wheelchair to post on the blog soon. 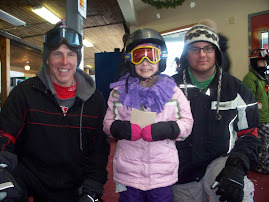 Annika went to Powder Ridge today to do some adaptive skiing!! She had a blast. At first I think we didn't have her implants totally working under the helmet so she was a little quiet in talking with the instructors but she would scream as she went down the hill. After we took a break to warm up a little bit the helmet got on a little better and boy did she have things to say!!! They went down the bunny hill a couple of times and I could hear her screaming the whole way down!!! She didn't want to leave and wants to go back as soon as she can to do more!!! 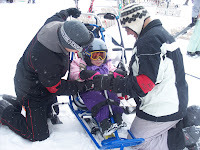 The picture on the right is her getting all buckled into the adaptive ski. Her DAPE teacher was there so she was excited to "race" him down the hill!! Oh, we are so glad that it is the weekend at our house. The big news was yesterday Annika was able to find out what teacher she is going to have for 1st grade. She has Mrs. Silverberg. She also has a few friends from last year in her class. But then there are other kids that she knew from preschool but didn't have in her class in Kindergarten. She is now asking me when do I go to school? She has her backpack packed and ready to go. It is still two weeks away!! Hopefully it goes fast. Daniel had picture day at football this morning so we got a few pictures of her with Daniel. It was funny to watch her. She listened to what the coach had told the kids to do with their uniforms when pictures were done. So off she went after Daniel, "Daniel, you have to go put your uniform away-put your pants away and hang up your shirt." Obviously she didn't think he listened well enough. Then we now know that Annika is starting to realize that her dad is gone. At least maybe it would be better stated that he is not coming back. When we were at football today, she was telling people, "my dad is gone." The good part is that she didn't sound sad about it-just stated it like it was a matter of fact. Hopefully that means she is starting to come to terms with what is going on in her life. Hard as it is we have to move on and go forward. School coming up quickly will help out a lot. We will be busy the next few weeks too and that helps too. Annika was eating supper last night-we were enjoying the first sweet corn out of our garden. After a few bites she looked at her corn and then said, "look blood". She was pointing to her corn on the cob. Sure enough she took out her tooth with a bite of corn. And for the first time she didn't swallow the tooth!!! We actually had a tooth to put out for the tooth fairy!!! She was so excited. I lost a tooth and it didn't hurt!!! She just kept telling me "see I can feel it" as she ran her tongue in the empty space. Okay, just a quick note to update from the past blog. Annika only had to wear her cast for one week. The doctor wanted her range to increase to 15 degrees and in one week she was at 18 degrees. Talk about my little overacheiver!!! Now we have to fight with her to wear her AFO at night. She complains because she says the brace hurts her leg. Well, unfortunately that is true but that is the purpose. She gets to have her muscle stretched every night while she sleeps. Thank goodness for tylenol!!! Yesterday Annika had a busy day. She was off to see the orthodics guy to get her new school shoes inserted with the lift she needs. She was a little sad as she had to leave her brand new school shoes with Dave and couldn't wear them home!! Then it was off to her first counseling appointment. She was very pleased that her couselor had the game UNO which is now her new favorite game to play (unfortunately we don't have it so that is on my list to purchase). Then we had to grab a quick lunch and then it was off to the twin cities to see her audiologist. My goodness what a difference 6 months can make. She did just awesome. There was a little setback on her single word test but the sounds she was off were just one sound off so not really big mistakes. But then she got 100% on her sentences in quiet. Wow!! It used to be that she could nail the single words but because she has the audiotory memory issue the sentences were a little difficult. Not anymore. She did then do the test in the noise and that proved to be a little more of a struggle so yes we see the need for the FM system and yet both her audiologist and I were impressed on how well she did because this was her first time in doing the noise sentence test (previous times she was done by the time we got to that portion so we quit). The not so fun news is that she had impacted wax in her ear canal so we had to run over to Dr. Rimmel's side of the office and have her wax removed. Our appointment went from 1 hour to 2 1/2 hours. UGH!! But in the end we got new ear molds poured and she is going to be sporting blue and pink ear molds to school this year!!! According to her it will match her outfits (she wears a lot of pink), her glasses which have a blue eye glass holder, and her new blue school shoes!! Way to color coordinate. She was so funny about this on the way in to see Barb. I had asked her what color she wanted for her earmolds and she would just tell me "you will have to wait and see"!!! It's like this . . . When you're going to have a baby, it's like planning a fabulous vacation trip - to Italy. You buy a bunch of guidebooks and make your wonderful plans. The Coliseum, the Michalangelo David, the gondolas in Venice. You may learn some handy phrases in Italian. It's all very exciting. After months of eager anticipation, the day finally arrives. You pack your bags and off you go. Several hours later, the plane lands. The stewardess comes and says, "Welcome to Holland." "Holland?" you say. "What do you mean Holland? I signed up for Italy! I'm supposed to be in Italy. All my life I've dreamed of going to Italy." But there's been a change in the flight plan. They've landed in Holland and there you must stay. The important thing is that they haven't taken you to a horrible, disgusting, filthy place full of pestilence, famine and disease. It's just a different place. So you go out and buy new guidebooks. And you must learn a whole new language. And you will meet a whole new group of people you would never have met. It's just a different place. It's slower paced than Italy, less flashy than Italy. But after you've been there for a while and you catch your breath, you look around, and you begin to notice that Holland has windmills, Holland has tulips, Holland even has Rembrandts. But everyone you know is busy coming and going from Italy, and they're all bragging about what a wonderful time they had there. And for the rest of your life, you will say, "Yes, that's where I was supposed to go. That's what I had planned." The pain of that will never go away, because the loss of that dream is a very significant loss. But if you spend your life mourning the fact that you didn't get to Italy, you will never be free to enjoy the very special, very lovely things about Holland. I have been in Holland for over a decade now. It has become home. I have had time to catch my breath, to settle and adjust, to accept something different than I'd planned. I reflect back on those years of past when I had first landed in Holland. I remember clearly my shock, my fear, my anger, the pain and uncertainty. In those first few years, I tried to get back to Italy as planned, but Holland was where I was to stay. Today, I can say how far I have come on this unexpected journey. I have learned so much more. But, this too has been a journey of time. I worked hard. I bought new guidebooks. I learned a new language and I slowly found my way around this new land. I have met others whose plans had changed like mine, and who could share my experience. We supported one another and some have become very special friends. Some of these fellow travelers had been in Holland longer than I and were seasoned guides, assisting me along the way. Many have encouraged me. Many have taught me to open my eyes to the wonder and gifts to behold in this new land. I have discovered a community of caring. Holland wasn't so bad. I think that Holland is used to wayward travelers like me and grew to become a land of hospitality, reaching out to welcome, to assist and to support newcomers like me in this new land. Over the years, I've wondered what life would have been like if I'd landed in Italy as planned. Would life have been easier? Would it have been as rewarding? Would I have learned some of the important lessons I hold today? I have become a world traveler and discovered that it doesn't matter where you land. What's more important is what you make of your journey and how you see and enjoy the very special, the very lovely, things that Holland, or any land, has to offer. Yes, over a decade ago I landed in a place I hadn't planned. Yet I am thankful, for this destination has been richer than I could have imagined!